The pursuit of reduced costs and enhanced margins have driven many organizations to leverage a broad range of global suppliers and external manufacturing partners. While operational norms have evolved, quality systems and technology infrastructures have not kept pace. As a result, many companies continue to manage quality and compliance activities with disconnected legacy systems, augmented with a series of appended manual steps and work-arounds. 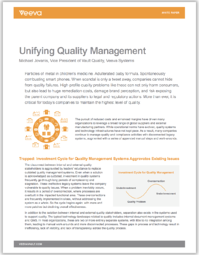 Read this white paper to see how organizations can avoid high-profile quality problems through a unified quality management solution. Ready to explore how Veeva can help you transform your organization?